Myss Lafunky's Blog: Desiring a Good Name: Is it Necessary? How was your weekend? My weekend was quite eventful. I attended a friend's surprise birthday. It was a nice time to catch up with friends and to rejoice with my darling friend who happens to be selfless in nature. People travelled from different cities within England to be at the surprise party. At the party, I pondered on the legacy/the seed that I am sowing when I meet people. What would they remember me for? If Myss Lafunky's name was to be mentioned, what would people say about me? What would people say about you? What seeds are you sowing? While it is vital that it is God's report that we should believe, God also wants us to desire a good name wherever we go or wherever we find ourselves. 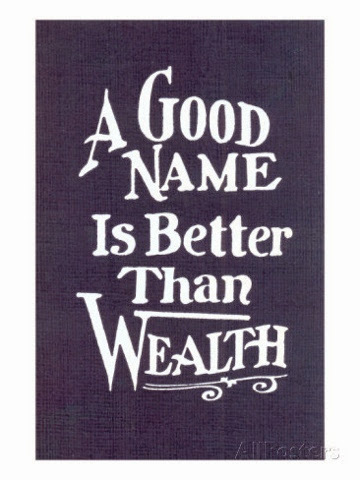 The word of God says in Proverbs 22:1 that: A good name is more desirable than great riches; favourable acceptance is more than silver and gold. At the same time, we must remember that, some people may still condemn us, remember our Lord Jesus Christ was condemned on earth? However, due to the fact that he lived a pure and good life continuously, his lifestyle showed that he was a good person and the false accusations stopped. Actually, some people have continued to condemn Jesus Christ (Please, remember to pray for the unsaved souls, pray that God will touch their heart so that they will know the true God). Some people still believe that He is not God, and some people have continued to say nasty things about Him. Only those that truly know Jesus or those that have regular fellowship with Jesus speak positive about Jesus. It could therefore be argued that, when people become close to you, they are likely to know the true you. Final words from me, remember to desire a good name from today..be ye on social media, at work, with your family, within your community, with your friends, church, school or wherever you find yourself.